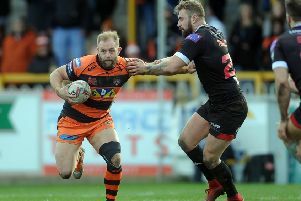 Bradford Bulls and Castleford Tigers have taken the decision to reschedule this weekend’s friendly to Friday with an 8pm kick-off because of fears of bad weather. After the intense snowstorm on the east coast of America over the weekend, the weather will cross the North Atlantic Ocean and fall on the UK in the form of constant heavy rain, which could make the Bradford pitch unplayable for a Sunday afternoon game. To improve the chances of the game going ahead, the Bulls and the Tigers have agreed to bring it forward to become a Friday night game under the lights at the Provident Stadium. Gates will open at 7pm ahead of an 8pm kick-off. Tickets for the game are adult (25-64 yrs) £15; concession (65 yrs plus) £10; young adult (18 to 24 yrs) £10; youth (11 to 18 yrs) £5; junior (5 to 11 yrs) £3 and they can be bought from www.castlefordtigers.com and the Tigers Den club shop. Official coach travel is also available priced at £8 a seat and can be booked in store at the Tigers Den.